Last month 26th October, I went to my primary school(Chung Shan) canteen day. My sister invited us to visit her school and support the canteen day sales fair. That day I perform a lot of things, more details refer to my main blog. I will post up soon! Now let you see that what I have on that day. Just only a simple but meaningful fried rice! I feel that I take a nice shot in this food! 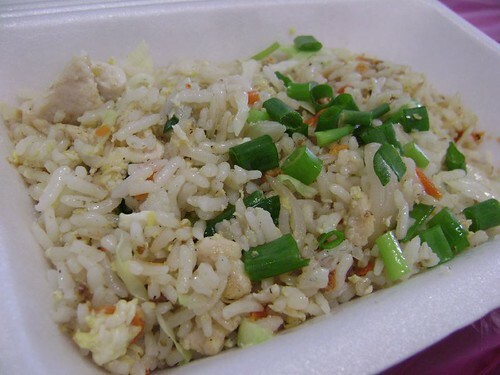 Anyway, this fried rice is bought from coupon RM5(if not mistaken). It fried with Siam recipes and some orient style. Nice to eat! I think this is people homemade and come to support! So now I need to ask her how to cook this. XD!